Profit in a competitive environment requires information to support efficient resource use in all endeavours including the forest and wood industry. The capacity to estimate value of a stand by modelling trees and simulating conversion along the whole value chain offers the potential to maximise efficiency, by enabling virtual trials of different production, processing and utilisation scenarios. Such a system needs three components, namely a virtual stem maker, a processor and an economic or accounting module. This project seeks to build a virtual stem maker that can define a virtual resource based on minimal field measurements. For decades foresters have used models to estimate future yields and used numerical analysis to predict the value or product outturn. The most recent developments in the field of production and conversion modelling attempt to link production and processing to capture a whole of value chain capacity to model quantity, quality and value. Existing systems are often cumbersome or limited in their ability and may only be applicable to a narrow context built from a discrete library of scanned or measured stems. To achieve the greatest utility, conversion models should be broadly applicable in an operational context and should not be constrained in its application to species, location or management history, produce virtual stems at reasonable cost and include all features necessary to describe product quality and value in any market. The attributes of a stem that need to be described to meet the design goals will include stem size, shape, knot distribution and wood properties. The method used to describe and store a virtual stem should allow an accessible user interface, make efficient use of computer memory, be inexpensive to produce and include all stem characters that are required to meet the design goals. This thesis describes a system that creates virtual stems as geometric solids in Cartesian space described by a set of data values and numerical expressions, which are more efficient users of computer memory compared to large arrays or rasters. The data structure is open-ended offering flexibility in the detail included in a virtual stem, limited only by the capacity to construct systematic or numerical descriptions. The scope of potential input sources includes, general information relating to a species, general information relating to plantation production, resource information (e.g. yield models, taper models, branching models) stand history and data collected in the field. Given that in an operational environment, complex models of crown or wood properties development will not be widely available, field data becomes an important source of information from which virtual stems may be formed. Field data may also be manipulated by an experienced user to assess the value of novel stands that may be produced from production management decisions. Simulated values for various characters can be generated using distributions of “nearest neighbours” within input data sets and have confidence that these values lie within the scope of real data. The “Resource Maker” is constructed to support user supplied functions describing various features of the stem and, where these are unavailable, provide a set of standard or generalised options, such as generic models that can be fitted to measured data. For example: Stem taper can be modelled using a standard parabolic function fitted to field measures of height and diameter. Stem form can be represented as lines joining points of inflection along a stem that can be measured in the field. Bark thickness can be estimated from over bark stem taper directly. Ovality of the stem or eccentricity of the stem about the pith may be calculated directly using stem form data and assuming a consistent response to stem deformation for a subject species. Knots can be inferred from crown character, which is in turn shaped by genetics and competition for light. Wood properties such as density may be estimated by applying known physiological behaviour to develop descriptive expressions along with estimates of average value and variation. Wood properties may be linked to age and or growth rate if these are relevant. Growth rings and internal stem character can be inferred by “back casting” growth. The primary goal of this work has been to produce a population of virtual stems that mimics a real stand or represents a novel stand description that captures sufficient detail to measure the interaction with processing and market. By achieving this goal, the benefits of conversion modelling can be extended to any context and will no longer be limited to discrete stem data bases or processing strategies. The challenge in meeting the design goal has been to establish that virtual stem descriptions of adequate detail can be created from a mix of input data types. A software package is presented that meets the design goals of flexible application and acceptable cost. Empirical assessment of stem shape and comparison of key statistics shows that the system is able to produce plausible collections of virtual stems that clearly reflect the input data and other expressions that are used to create them. This work has shown that virtual tree stems can be created using inventory data and other sources of information at reasonable cost. This presents opportunities to more effectively exploit available information at reasonable expense, to improve the management of both wood production and conversion systems. 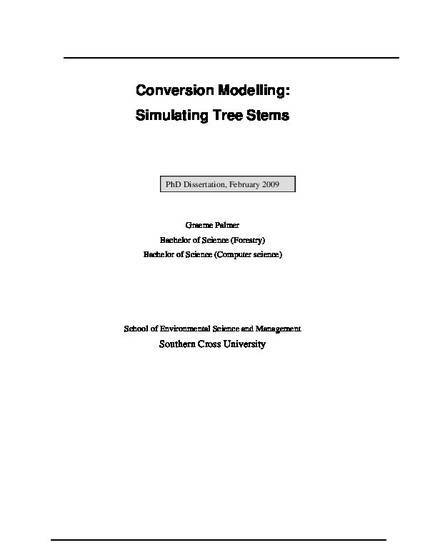 Palmer, G 2010, 'Conversion modelling: simulating tree stems', PhD thesis, Southern Cross University, Lismore, NSW.